Manufactured in a facility that also processes milk, egg, fish, crustacean, mollusc, tree nuts, peanuts, shrimp, sulphites products. Ingredients: Noodles: Wheat Flour, Palm Oil, Modified Potato Starch, Salt, Colour (Riboflavin), Stabiliser (Guar Gum). Soup Base: Salt, Flavour Enhancer (Monosodium L-Glutamate), Sugar, Dried Vegetable Powder (Onion, Garlic, Roasted Red Pepper), Seasoning Powder (Soy Sauce, Starch Syrup, Salt), Hot Pepper Paste (Onion, Red Pepper, Corn Syrup), Yeast Extract Powder, Soy Sauce Powder (Soybean, Wheat, Water), Black Pepper, Ginger Powder, Red Pepper Seed Oil Powder, Capsicum Powder, Colour (Plain Caramel). Dried Vegetable: Red Pepper Flake, Seaweed Flake, Welsh Onion Flake. 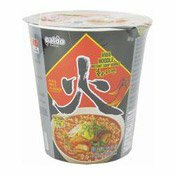 Simply enter your details below and we will send you an e-mail when “Hwa Instant Cup Noodles (Hot & Spicy) (韓國杯火麵)” is back in stock!